ChildFund Ambassadors Aoife & Mags recently returned from an unforgettable first visit to Ethiopia. Here both women share their personal reflections on the trip, and explain just why they are proud to be a part of our Dream Bike Initiative. Our ChildFund Ambassadors Aoife and Mags are now back in Ireland and have settled into their normal working routines but the memories of their recent visit to Ethiopia remain colourfully vivid. For both women, the trip provided a unique opportunity to visit a rural African township and see first-hand the work ChildFund does in developing countries like Ethiopia to help children and their families. Over a hectic, action-packed week there were many stand-out experiences that will live long in the memory. 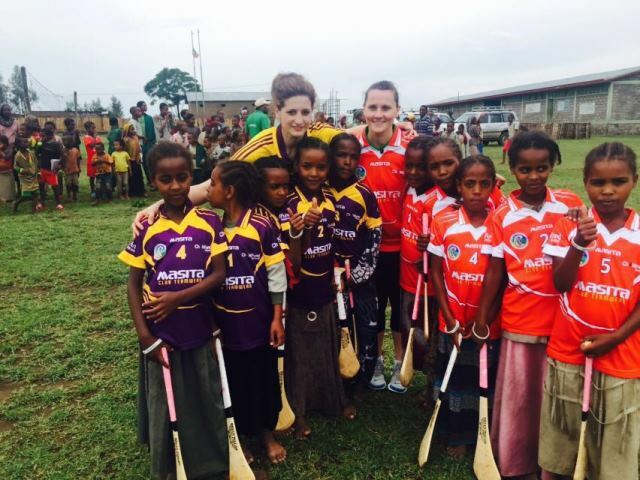 Here Aoife and Mags offer their initial impressions of Ethiopia and its people, reflect on the joy of bringing camogie to Africa, and explain what it feels like to be spearheading a campaign like Dream Bike. My initial impression of rural Ethiopia was to marvel at the people’s resolve to operate their daily operations and livelihoods with minimal resources available, which to me was phenomenal. The constant work ethic of the people both in the city and out in the programmed area shows the strong values the people of Ethiopia withhold themselves too. The first time I met my sponsored child was incredible. Being surrounded by Subontu and her mother, I really never stopped smiling! Even with the language barrier, the gratitude which I received cemented the great care and services ChildFund Ireland directly provide to Subontu, her mother and her community. The impact of a small donation truly is direct and evident, and it’s hard to believe what I’ve gifted by simply giving up 2 coffees a week, shameful to think when I say it out loud! What struck me about life in rural Ethiopia versus Wexford is that community collaboration is very similar to home, in that neighbours help each other by whatever means possible. However on the flip side, the lack of transport, shared housing space and daily community markets mean that everybody (from all age demographics) within the community engage with each other on a more regular basis. Community interaction is a fundamental part of their days. When we met the first girls to receive bikes as part of the Dream Bike campaign I saw an automatic sense of empowerment from the girls – they literally grew 2 foot taller after receiving their bikes!. For girls of their age, they instantly calculated the value of what a bike can offer them as an individual and also for the future of their families. What blew me away was the community’s excitement of seeing the girls getting to grips with the bikes. The programme area sets huge value on education; therefore the importance of the Dream Bikes is massive to enable these girls get to and from school in a safe manner. 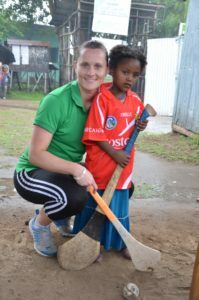 The trip afforded us an opportunity to stage what was perhaps Africa’s first ever Camogie match! Apprehensive at first, a 30 second tutorial was all that was needed for these girls to swing into action, literally! They embraced every single swing, block, tackle, never a complaint just utter excitement to get on the ball and make the crowd cheer. The enthusiasm naturally overflowed into the surrounding crowd as their fellow students and community where as vocal as any September day in Croke Park! I truly walked away with the affirmation that we have the best game in the world on our little island. When the sport goes global, these Ethiopian girls will definitely be waiting in the long grass for us! Ethiopian girls line out for Cork v Wexford in Ethiopia! I always felt and understood the importance of my Ambassador role however since returning from the field, I find myself unknowingly speaking with overwhelming passion about the incredible work ChildFund Ireland do for the people in our programme areas. The lifespan of what €20 a month can do in Ethiopia versus Ireland is literally a world apart. I truly now have a sense of value and I will by whatever means possible try and help get that message across to our greater sporting community. I would like to see ChildFund Ireland, the Camogie Association and wider and Camogie community actively engage and market the content captured on our field trip to educate young Camogie players nationwide. With over 550 Camogie clubs aligned up and down the country, let our minimum aim be “one bike, one life, one club” for 550 Dream Bikes to be delivered to our programmed areas by the end of 2016. My first impressions of Ethiopia were…there are people everywhere!! I was somewhat amazed at the fact that you were on a dirt road yet people are always there walking, or on a donkey and cart. This is not a sight you see in Ireland anymore. Also goats rule the road! Another impression of the program area was how friendly the people are, they have little or nothing yet they have the ability to make you feel so welcome. This is something I will never forget…we could all learn from these beautiful people. I remember waiting in the room getting ready to meet my sponsor child for the first tie and thinking “Aoife don’t get emotional”. I wanted to make sure she enjoyed this moment as much I was going to. You read about where your money is going but this was seeing it with your own eyes and wow, what a moment. The first thing I thought was, my god she is simple beautiful…..big eyes looking up at you somewhat nervous of this strange person. But once we started to play Camogie she blossomed into a fun loving child and I could see my own nieces in her – the joy of sport breaking down barriers. I can’t compare it to anything I have ever experienced before. I grew up on a farm in a very tight-knit community. You’d often look out the window and see the neighbour driving off with your parent’s trailer and not taking an ounce of notice…or being sent up to Canty’s to help with a sick cow. This was something I could see in the local community in Ethiopia – all pitching in to help each other. There seems to be a massive community spirit, something I feel we may be losing in Ireland. Something that was very different too was the kids and the responsibility that they are given at such an early age. 5 year old kids carrying their baby brother or sister on their back….or literally working the farm! This is something you just don’t see in Ireland. Meeting the first girls to revive bicycles as a result of the Dream Bike campaign had a massive impact on me. You could feel the excitement from the girls. They were so nervous at first but once they got a bit of confidence they couldn’t be stopped! What I also found out was it meant a lot to the families because for most of these girls, the walk to school can be a long and dangerous one. Seeing them cycle around the village with this big smile on their face, it couldn’t but make you feel like a better person. I think I was smiling from ear to ear. The experience of playing camogie in a totally new environment.. amongst people who had never seen it being played before or knew anything about it, was amazing. They were naturals at it. I wasn’t expecting for them to be so natural with the Hurley, yet with little instructions they were able to pull on the ball and get the basic idea of camogie. That game will forever be one of the best experiences of my life. The energy that they brought to the game was infectious and made me realize why I love this game. They simply got it!! They got the game, the competition of it and the pure joy it can bring. It was one of those pinch yourself moments…I think anyone that was there all believe we were experiencing something so special – something money could never ever buy. Does the idea of being an Ambassador for a charity seem more important to me now that I have visited and see the work that an organisation like ChildFund does first hand?..100% yes! After seeing it in the flesh what this charity does and what it stands for….now I truly feel emotional invested in being the best Ambassador I can possibly be. The message for me is clear, a little can go miles – it really can. I love my role as an Ambassador. We as a Camogie Association have given our member’s a target of 200 bikes for the Dream Bikes campaign. My hope is that we smash this target!! We have hundreds of clubs across the 32 counties; it would be my hope that all get involved in this partnership. We may be a small island compared to the likes of Ethiopia but we can make a difference. I want this partnership to be a template for all other sporting associations…”this is how it should be done”. 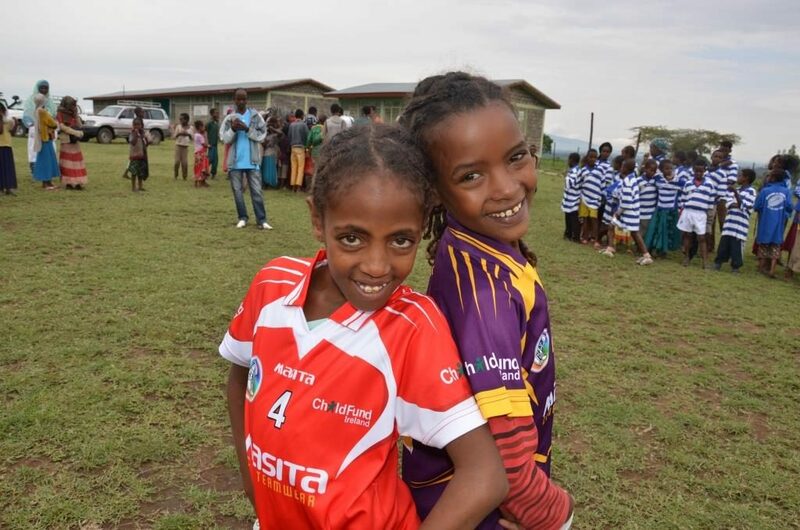 Children and local communities are at the heart of the camogie association and ChildFund are experts at both. Together we are stronger and can make a big difference in local community life for those that need it the most. Maybe in 12 months’ time we can go back and have a mini camogie blitz! ChildFund Ireland sincerely thanks Aoife & Mags for giving up their time to visit Ethiopia with us, and for taking on their Ambassadorial role’s with such energy, passion and enthusiasm . Their passion can inspire others in the Irish sporting community to work with us for the betterment of children and their families in developing countries, where initiatives like Dream Bike can make such a massive difference to quality of life. We would also like to extend our warm thanks to Brian Walsh Hurley’s and Cúl Sliotars for providing sporting equipment and jerseys, to Naas Camogie for jerseys, and finally to Anne Cassin and the RTE Nationwide team who documented this wonderful trip for an upcoming broadcast. Please support our Dream Bike Initiative for girls, and explore our website to find our more about our work for children in the developing world.